Save Indian Family Movement takes a giant Leap. 1. 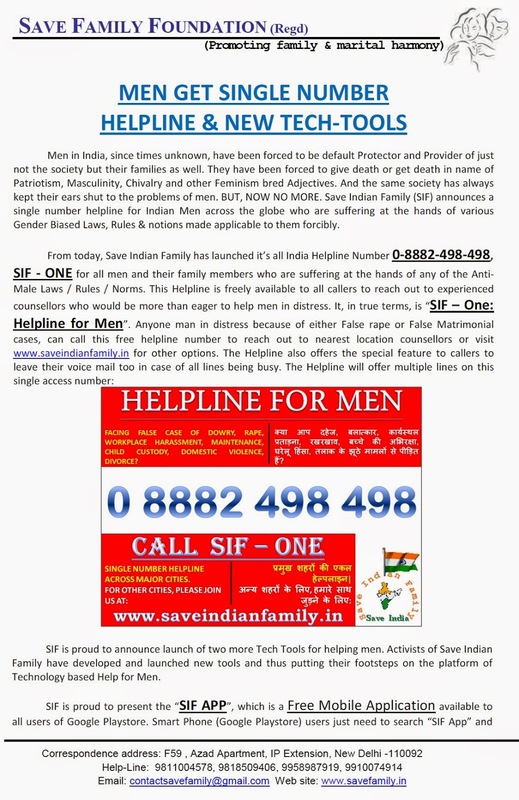 SIF-One: Single number (08882498498) Helpline for Men. 2. SIF App: Free Mobile App on Google Playstore. 3. 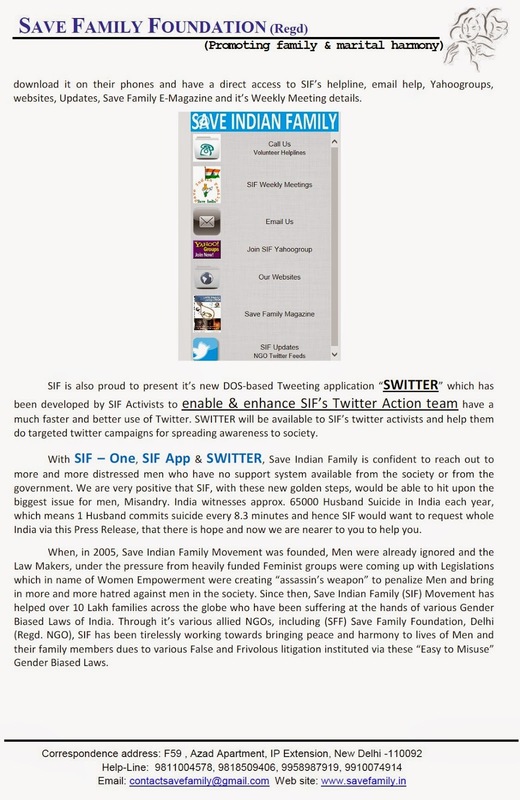 SWITTER: Application developed by SIF, for SIF to help SIF members use Twitter with lot of Innovation. We Welcome you to the future. SIF - ONE IS A SINGLE NUMBER HELPLINE FOR VICTIMS TO REACH OUT FOR IMMEDIATE HELP FOR ISSUES RELATED TO PROBLEMS FACED BY MEN. THIS IS A DREAM COME TRUE AS OVER 10 CHAPTERS WITH OVER 20 NATIONAL ACTIVISTS WORKED FOR LAST 1 MONTH ON BRINGING THIS SINGLE NUMBER HELPLINE TO MEN. SO, PLEASE DONT FEEL DEPRESSED OR SAD, HELP IS OUT THERE, REACH OUT. JUST DIAL 0-8882-498-498 (we are sure, this will not be a difficult number to remember). SIF - ONE IS NOW OPERATIONAL. So many Mobile Applications (apps) for women, games for children, for metro, for maps for animals, for trees, for senior citizen. SIF is proud to present SIF App.|| SIF App is a FREE Mobile Application that can bee freely downloaded from Google Playstore and will give you a direct access to SIF's Websites, Emails, Helplines, Updates, Magazine, Meeting venues and a lot more right there on your Smart Phone. Men were always Smart and we are proud to present this Smart App for your Smart Phones. Now, Save Indian Family is just a TOUCH away.